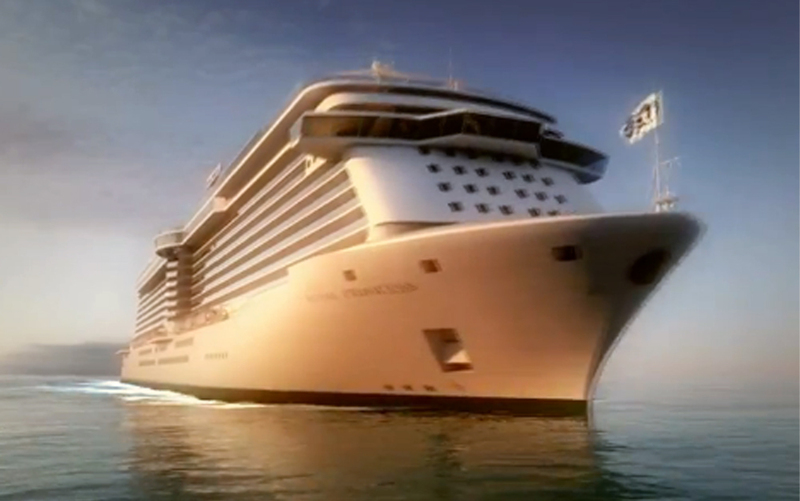 [Princess, Santa Clarita] – When the new Royal Princess launches in June 2013, Captain Tony Draper will be at the helm of Princess Cruises’ newest vessel, leading a senior officer team with more than 100 years of seagoing experience among them. The senior four-stripe team will also include Relief Captain Dino Sagani, Chief Engineer Fabio Braccelli, Hotel General Manager Dirk Brand, and Staff Captain Tim Stringer. The 3,600-passenger Royal Princess is a new-generation ship currently under construction in Italy that will debut a number of new features for Princess, including a dramatic over-water SeaWalk, a 50 percent larger atrium, a new Princess Live! television studio, and balconies on all outside staterooms. * Captain Tony Draper – Captain Tony Draper has been in command of a number of the company’s vessels since 2006, including Ruby Princess, Crown Princess, Caribbean Princess, Dawn Princess, Sun Princess and Coral Princess, as well as ships for sister companies P&O Australia and Cunard. Draper began his seagoing career with the Royal Fleet Auxiliary Service – the UK’s civilian manned supply and logistics division of the Royal Navy. After gaining his Masters Certificate in 1994, he also pursued a lifelong interest in aviation, gaining a UK commercial pilot’s license in the same year. In 1995, he joined Princess Cruises as navigator of the original Island Princess. It was on this ship, one of the original Love Boats, that he met his wife, Joanna. Originally from Scotland, Captain Draper now lives in Cornwall, UK with his wife and young daughter, Alysia. * Relief Captain Dino Sagani – Captain Dino Sagani commanded a variety of Princess vessels, including Sea Princess, Dawn Princess, Sapphire Princess and, most recently, Diamond Princess. Sagani was born in Trieste on the North East Adriatic coast of Italy. Following the family tradition, he studied at the Nautical College in Trieste, which is one of the oldest Nautical Schools in Europe. On completion of his studies, he joined the Italian Navy, serving on a minesweeper during the first Gulf War. After the Navy, he joined Princess Cruises in 1995, where he quickly climbed the ranks and was promoted to captain in 2007. * Chief Engineer Fabio Braccelli – Hailing from the town of Lerici along the Italian Riviera, Chief Engineer Fabio Braccelli oversees all the maintenance and operation of the ship’s extensive machinery systems. Braccelli has worked aboard 12 Princess ships, including most recently on Sapphire Princess. A graduate of the nautical school Nazario Sauro in La Spezia, Italy, Braccelli subsequently served in the Italian Navy and first joined Princess Cruises as a cadet in 1990 aboard the original Dawn Princess. He moved up through the engineering ranks and was promoted to chief engineer officer in 2004. * Hotel General Manager Dirk Brand – Hotel General Manager Dirk Brand will oversee all hotel functions aboard Royal Princess, a position he has held aboard a variety of Princess ships, including Ruby Princess during the ship’s inaugural. He has also worked aboard the ships of sister company Cunard. Brand was born in Berlin, Germany and grew up in Munich. After completing his education and apprenticeship in hotel management, he served with the Air Force in Sardinia, Italy. Fluent in three languages, Brand began his career at sea in 1998 as a senior assistant food and beverage director during the inaugural season of Grand Princess. He currently resides in Spain. * Staff Captain Tim Stringer – Head of the deck department and second in command to the captain, Staff Captain Tim Stringer has worked aboard eight Princess ships, plus several vessels from sister companies P&O and P&O Australia. He has also been involved in the plan approval team for the construction of the new Royal Princess. Stringer first joined Princess as a second officer aboard the original Royal Princess in 1995. A native of Bedford, England, Stringer began his career as a cadet aboard tankers, and holds both UK and Canadian master mariner certification. Royal Princess debuts June 16, 2013, and will sail on a maiden season of Mediterranean cruises throughout the summer, followed by Caribbean sailings in the fall. One of the best-known names in cruising, Princess Cruises is a global cruise and tour company operating a fleet of 16 modern ships renowned for their innovative design and wide array of choices in dining, entertainment and amenities, all provided in an environment of exceptional customer service. A recognized leader in worldwide cruising, Princess carries 1.3 million passengers each year to destinations around the globe ranging in length from three to 107 days. The company is part of Carnival Corporation & plc (NYSE/LSE:CCL; NYSE:CUK). Princess Cruises is a proud member of World’s Leading Cruise Lines. Our exclusive alliance also includes Carnival Cruise Lines, Holland America, Cunard Line, Costa Cruises and Seabourn. Sharing a passion to please each guest and a commitment to quality and value, World’s Leading Cruise Lines inspires people to discover their best vacation experience. Together, we offer a variety of exciting and enriching cruise vacations to the world’s most desirable destinations. Visit us at www.worldsleadingcruiselines.com.